We invite you to read the report which is the result of monitoring carried out in the framework of the project “Monitoring the use of alternatives to detention of foreigners”, financed by the program “Citizens for Democracy” from the Financial Mechanism of the European Economic Area. 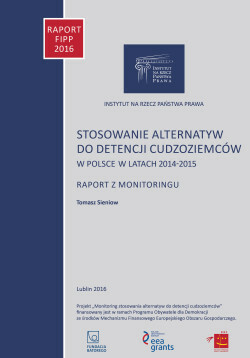 This report confirms that the introduction of alternatives to detention of foreigners in Polish legal system means securing the course of post-proceedings on the obligation to return and proceedings granting international protection. This had a positive effect on the situation of foreigners staying on Polish territory.